I wanted to try something different with a sofa table and had this idea. The really difficult part was making the top and bottom corners line up – I actually had to cut out the flies corner twice to get it right, but in the end I was happy and it was the first piece to sell at the art show I had it set up at, so I think it worked out. I might do another one of these this year, since my wife told me that if it didn’t sell it was staying at our house! 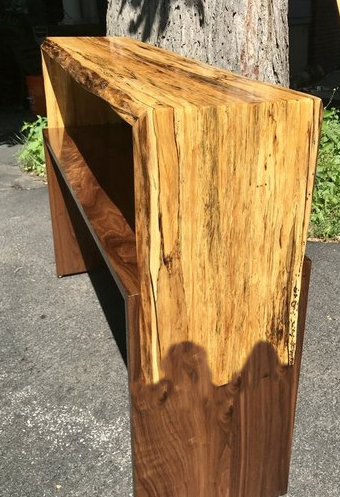 yeah very cool i like the look and the woods are beautiful together.i like simple designs that show off the wood and this does that well.nice work buddy.and congrats on a quick sell,id say do it again. Thanks guys! It is a nice simple design! @LoganN I can’t wait to see what you come up with. What joins the one layer of wood to the other (the light to the dark)? Is is just a big glue joint? Interesting piece. How about a little more info? How were the mitered joints done? Biscuits? Dowels? Splines? 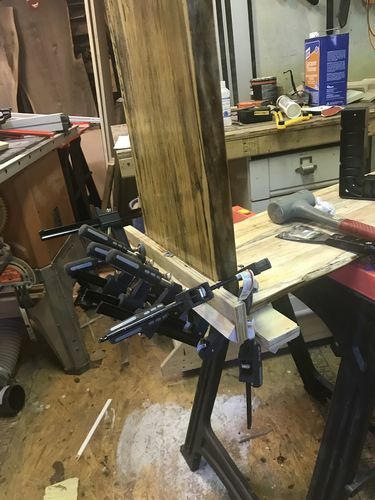 Swirt – I actually opted for an easier method: I drilled 3 oversized holes (arranged in a base down triangle) and glued, clamped, and screwed the whole thing together, then I put some walnut dowels into the holes to hide the screws. If I do it again I might try to do the leg assemblies as single pieces (dominoes with glue?) and then cut the walnut to fit the center and bring it down that way. Builtinbkyn- sorry. I just didn’t think about it! Lol – these are cut at a 45 with my makita track saw (one of the best purchases I’ve ever made) and reinforced with festoon dominoes (another one of the best purchases!) and glued up. I used a board with sandpaper on the flat side and long triangular cut glued on the other side and clamp them together to get the miter clamped up!